THE latest reports from England bring us an account of a new gun, of extraordinary dimensions, weighing no less than 22 1/2 tons. 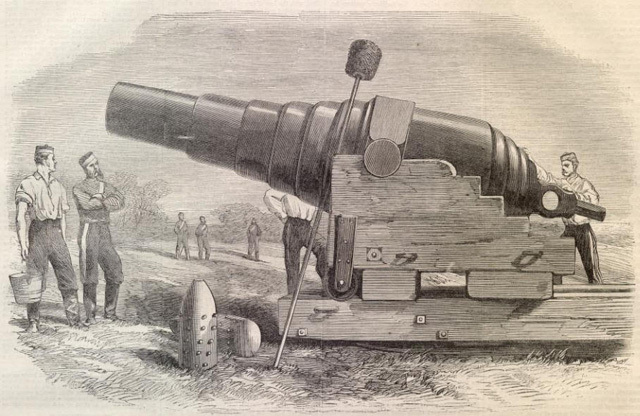 This enormous bit of artillery has been built by Sir William Armstrong, under the auspices of the British Government, and has been lately tested off Shoeburyness. A sketch of the gun will be found on page 76. It has been built, we say; for a piece of this size could not possibly have been forged as a whole. The principle upon which it is constructed is that the greatest strain comes at the breech; and in accordance with this principle, the immense weight is distributed, by means of laminal cylinders of different lengths, as seen in the illustration. This has been the principle involved in all Armstrong guns; the novel feature in this one being that it carries a six hundred pound shot, and is so wisely distributed as to its weight that it is only four feet longer than the 300-pounder, although it is more than twice as heavy. Not only is the gun made up of cylinders, one inclosing another, but each particular cylinder is composed of several small rings, or coils, of iron welded together lengthwise. The outward layers are turned without and within, and are subjected to a great heat when they are fitted over the interior cylinders, and, cooling, contract with such force of pressure as to be most compactly welded together. The gun is rifled with ten grooves, and to secure the rotation of the shot the latter has upon its surface ten rows of studs fitting into these grooves; the bore being 13 3-10ths inches in diameter. It is proposed to carry guns of this description on iron-clad war-vessels, and if it should be found practicable, it would necessitate a complete revolution in the defensive armor of ships of war, as no vessel in existence could withstand the effect of the 600-pound steel shot. The practicability of their use for this purpose is, however, extremely doubtful, as in a heavy gale very much smaller guns are frequently displaced. But for harbor and coast defenses this enormous war engine is of the greatest value and perfectly available. Its possible range, at an elevation of 10 degrees, is over four thousand yards, the charge being 70 pounds of powder. If we compare our own progress in naval armament with that made by the British, we shall find that a preference has been always given by us to cast-iron guns, small charges, and heavy shot at low velocities; while in England steel guns are preferred, with high charges and light shot, at excessive velocities. Twenty-inch guns have, however, been constructed in this country capable of carrying a 1000-pound shot, but these have been found, as probably this new 600-pounder will be, unavailable except for harbor and coast defense.